Pacific Island Countries: Educators and creative artists come together with UNICEF’s support to address children’s emotional wellbeing after Cyclone Pam! Educators and creative artists come together with UNICEF’s support to address children’s emotional wellbeing after Cyclone Pam! Port Vila, Vanuatu - More than 50 professionals from diverse backgrounds in health, education and child protection are now well placed to help meet the psychosocial needs of children distressed by Cyclone Pam and its aftermath. A recent weeklong orientation supported by UNICEF and the Government of Vanuatu through its Education, Justice and Health ministries, drew on international research and experience around the world to help childcare professionals and creative artists understand the impact of stress and trauma on young children and learn some of the best practices in nurturing self-confidence and overall healthy development. The professionals and creative artists also learnt how to produce international standard, holistic and inclusive print communication and learning materials. As part of this, they developed 10 illustrated children’s story books and 12 posters. Madlen third from right taking part in group work activities during the workshop. Madlen, the mother of two young girls, hails from Clubhipipique community, a 10-minute drive outside Port Vila. When she was 22, Malden suffered from a spinal infection, which paralysed her limbs. “This workshop couldn't have come at a better time, a time when we needed our voice heard. This was my first time to be in such a workshop. Before this workshop I used to run a kindy for the young children in my community. This orientation has given me renewed strength and I'm confident that through the friends I have made and new knowledge gained in this workshop I will be able to reopen my kindy and help the children in my community,” says Madlen. Sixteen-year-old Alex Ham from Ambrym island in Vanuatu is the youngest participant and thrilled to be part of a group producing for the first time, books and posters in Bislama that address specific psychosocial needs for children and families. 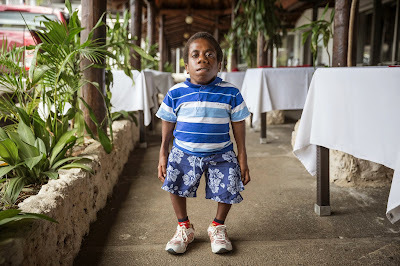 Alex is short in stature, standing about a meter high but that hasn't stopped the aspiring youngster from playing a lead role as the main actor in Vanuatu’s Rainbow Disability Theater Group. “I am really happy to be in this group because it is giving me new ideas that I can use in our plays. There are many good messages that I am learning about that we can use to educate people and children when we do our plays in communities,” Alex explains through his carer, Rachael. The Rainbow Disability Theater Group performs plays to create awareness about issues facing people with disabilities.